Some days we wake up not wanting to go to work, get out of bed, be a mom, or tackle the “to-dos” of life. If you aren’t experiencing that feeling today, you’ve most likely experienced it some time. That feeling doesn’t have to stay that way. In fact, by implementing one secret tool that I personally use, your day can shift from “ho-hum” or “woe is me” into a GREAT ONE! Yesterday morning (Monday), I woke up extremely exhausted from my Sunday. Being in the ministry, Monday’s are my Saturdays. Robert has a private practice on Mondays so he gets to sleep in. I was looking forward to rejuvinating myself in the presence of the Lord and spending time with Him alone. It didn’t work out as I had planned. I woke up at 7:30 a.m. (that’s really late for me!) and hoped out of bed. I sat on the couch and heard that cry. Our two year old, Emma Payge was awake. I thought, “No!! !” I just wanted some time alone. I went into get her and fixed her breakfast, and decided that I was still going to seek the Lord despite the fact that I was already in “Mommy” mode. I set her up with things to eat and then turned on Sesame Street. I thought I could slip into the office to quietly study the Word but as soon as I got in there, she yelled “Mommy! Come watch Sesame Street with me!” Really?! Do I really want to watch Sesame Street? 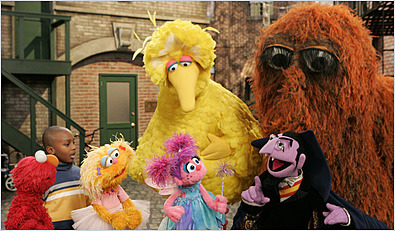 Being a good mother, I went back onto the couch and sat there studying the Word with Elmo, Snuffleupagus and Big Bird singing about the letter X.
I don’t have enough time to tell you ALL that happened in my time with the Lord, but it was so sweet and so good. Nothing emotionally spiking or life changing, but it shifted my day. I started that morning burnt out, tired, exhausted and in a disposition to whine and complain. If I didn’t do something about this attitude then Robert and Emma would have not had a good day. And I wouldn’t have gotten anything accomplished. Instead, I sought the Word (the Bible), not knowing where God would take me and it was good. God gave me an assignment for the day that would walk me through the day with peace, productivity, wisdom, and love. I had an incredible day! I started off studying the Word by reading the day’s devotion from Sarah Young’s “Jesus Calling.” I haven’t read from a devotional in years. I received this as a gift for Christmas and love it! The scripture at the bottom of her devotional launched me into the Bible. I typed out my study for the morning for you. It’s like a goose chase to follow me in my time with the Lord. Feel free to follow along this chase sometime this week and see what treasure the Lord brings you to. It’ll most likely be different from what I found because our God likes to give personalized lessons for each and every person. 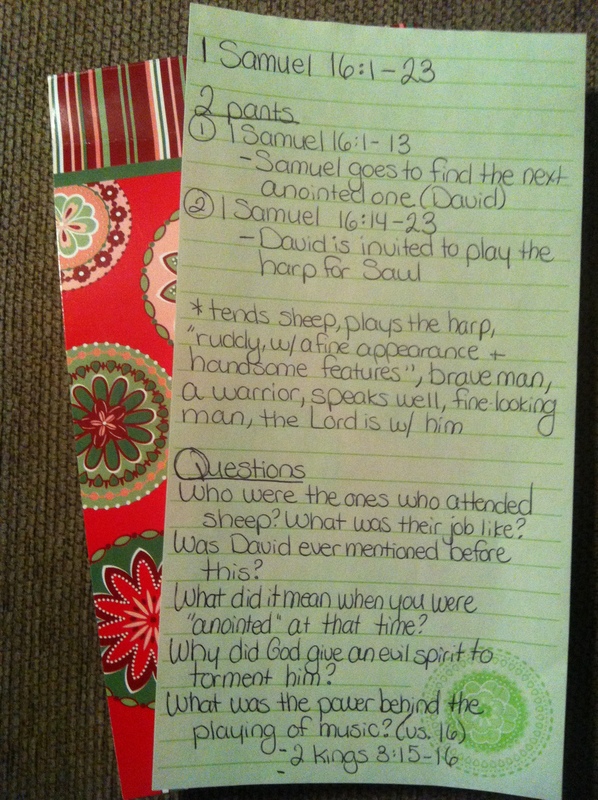 Click on this link to follow my detailed goose chase through the Word of God. You can use this as your own study today or some time during this week. 7:30 a.m. to 9:45 a.m. I studied the Bible on the couch. 10:15 t0 11:15 am. I went for a worship walk and talk with God. 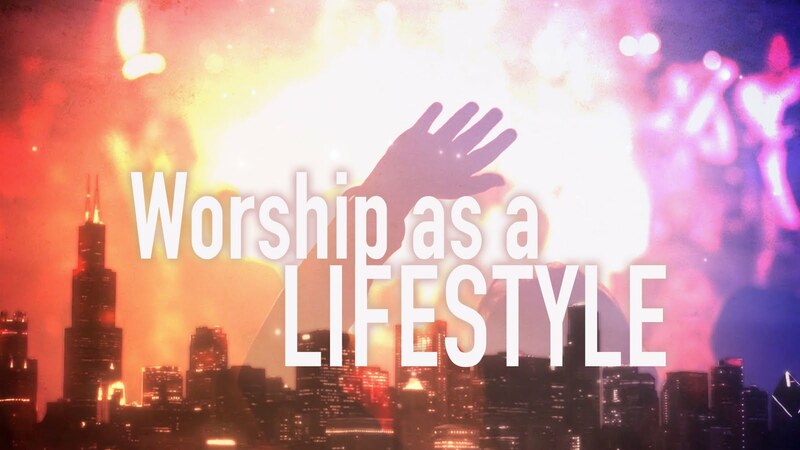 Throughout the day I played worship music whenever I was in the car running errands, at home cleaning or cooking, and while in the shower and getting ready. Whenever there was silence, I played worship music. After spending time studying the Word (even though I didn’t really want to at first), I walked away with TREASURE for my day. 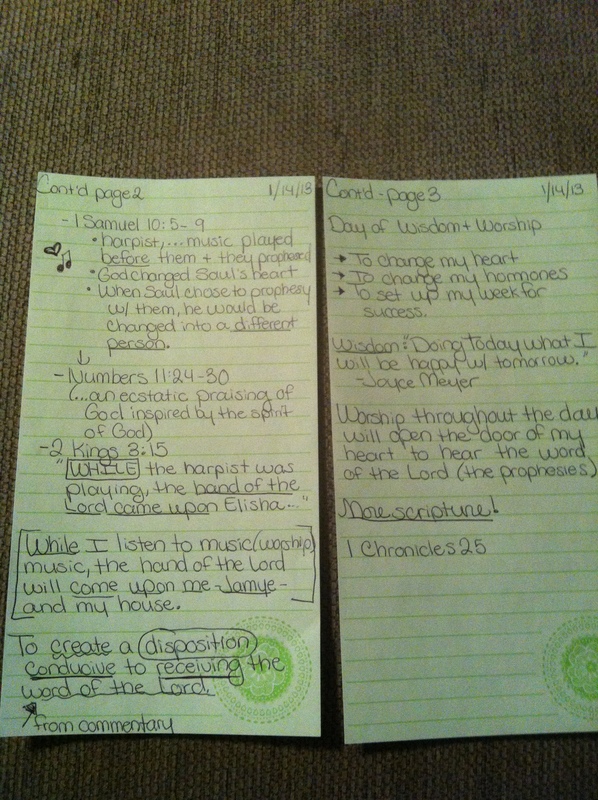 This was my command and reward for yesterday: Worship & Wisdom. Worship throughout the day will OPEN the door of my heart to hear the word of the Lord (the prophesies from Him), change my disposition, give me a happy heart and a happy home. As I worshiped, it created an atmosphere for me to accomplish the things that I didn’t want to do. It created a place in my heart that connected with the peace from heaven. It gave music to my day. For me, my day was conducted by the Father in heaven, playing His songs in my heart. Even though I’m ready to pop (meaning really pregnant!) I was so filled with heaven’s hormones and not my own. Robert and Emma actually wanted to be around me. I did the grocery shopping for the week (with joy!). I planned Robert’s meals for the week (since he’s on my 12 week body transformation program that I wrote…will be available for you in April 2013). I paid some more bills and balanced our funds. All of those things were treasures for me. Things that I didn’t want to do at first but decided to do because I would be happy with the results. I WAS changed into a different person, like Saul. I was a worshipper of Jesus, like David. There were so many treasures in my study yesterday that I could have landed on many of them. But as I promised you last week, I will open up my intimate times with the Lord and reveal to you what He and I do together. 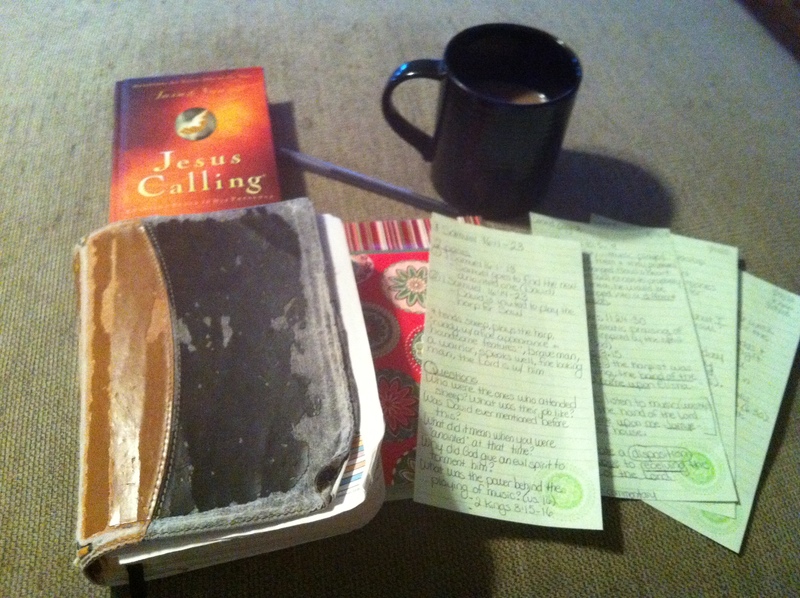 Enjoy your time studying His word, seeking His face, and basking in His glory. So, the ONE secret to changing your day into a GREAT one? Worship. Worship Him throughout the day. My exercise playlist from yesterday (this is what I listened to…) For some reason whenever I’m pregnant, I LOVE listening to Jason Upton. I never worship with him any other time but his voice and lyrics are always empowering bring me into a place of worship as I prepare for my supernatural pain free childbirth. I meditated and worshiped to these songs while on my walk. Some of them I played two or three times in a row. I too loved that day of devotion. Took me on some rabbit trails but good ones!